I hate getting papers without a name on them! It seems like no matter how many times I tell students to write their names on their papers, it doesn't sink in, and I am left with a pile of No Names! I changed things up with my students and now we write a fun sentence on the top of each paper! For example, we might write, "Student Name knows math." This gets students to write their name on the papers, gives practice on writing in complete sentences, and has positive reinforcement for the students. Now my students remind me about the sentence that needs to be written on their paper! Want more tips? 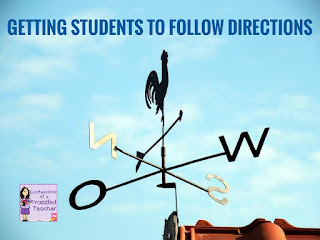 Check out my post on Getting Students to Follow Directions by clicking the picture below!